MDC-T president Nelson Chamisa yesterday said if voted into power he will expel Chinese investors and cancel deals Government signed with the world’s second largest economy running into billions of dollars. 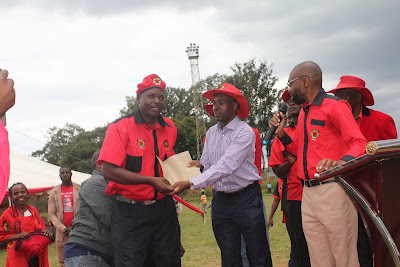 Mr Chamisa made the remarks at Dzivarasekwa Stadium during the Zimbabwe Congress of Trade Unions organised Workers Day celebrations. The celebrations largely turned out to be an MDC-T rally. Zimbabwe and China have signed several deals running into billions of dollars spanning from energy, roads and general infrastructure development. “I have seen the deals that Ngwena (President Mnangagwa’s nickname) has entered into with China and others, they are busy asset stripping the resources of the country. “I have said beginning September when I assume office I will call the Chinese and tell them the deals they signed are unacceptable and they should return to their country,” Mr Chamisa said. He said his party wanted genuine investment that benefited the people. The Chinese have assisted the country in various projects that include the extension of the Kariba South Hydro Power Station which added 300MW to the national grid, the ongoing rehabilitation of the Morton Jaffray Water Works that supply water to Harare and dormitory towns of Chitungwiza and Norton. They have also provided funding the extension of Victoria Falls International Airport that has seen tourist arrivals increase while funds have also been secured for the expansion of Robert Gabriel Mugabe International Airport and Hwange Thermal Power Station and construction of a new parliament building . Mr Chamisa reiterated his promise to introduce bullet trains and construct ‘spaghetti’ roads and adopt e-government that would make it easy to access birth certificates and other records. “I am talking of spaghetti roads but some do not understand it, I am talking of bullet trains, some do not understand it. Yes vision is not for all but provision is for all. “Support me in my vision and you will get your provision,” said Mr Chamisa. Meanwhile, Mr Chamisa admitted that they were abusing the courts in their battle for use of party name and symbols with the Dr Thokozani Khupe led faction. Mr Chamisa and his MDC-T faction had their urgent chamber application seeking the High Court to bar Dr Khupe from using the party name and its symbols dismissed. Justice Francis Bere ruled that the matter was not urgent adding it was best dealt with through arbitration. “There is this story of our former female friend from Bulawayo whom some think may mess our things but don’t be afraid, we have finished with that issue and it will not cause confusion,” he said. After Justice Bere’s ruling, Mr Chamisa attacked the judgment saying it was political but has since appealed to the Supreme Court.